Do you often feel frustrated when facing with huge video files? Beyond question, the answer is positive. Commonly, the larger size of video will bring us much inconvenience, for instance, your need more disc memory to save these huge 4K videos; your large video files are taking up your storage space in your iPhone or other devices; or it's too slow to upload a large-size file to YouTube or E-mail, etc. In such cases, to compress video files is regarded as the most sound way to escape from the above blocks. But how to downsize the videos into smaller ones without losing too much quality? Take it easy! In this article, 5 solutions are shared for you to compress MOV, AVI, MP4, MTS, MKV, and other huge HD/4K videos to smaller size, each having their own merits. MacX Video Converter Pro - Compress large video files even in 4k UHD resolution to smaller-size MP4 FLV MOV WMV with lossless quality. Built in advanced compression engine allows you to shrink video by up to 90% with proper codecs, resolutions, frame rates, bit rates, audio settings. Unique level-3 hardware acceleration speeds up the video file compression dramatically with enhanced output image quality. Strengths: 3-in-1 video shrinker, video editor and transcoder to resize video in smaller MP4 WMV FLV WebM etc with codecs, resolution, bit rate, etc lowered or upped at your willing. This makes MacX Video Converter Pro easily earn the Golden Award in video size reduction and encoding. To be specific, this all-in-one video compression software enables you to convert and compress MP4, MKV HD, AVI MTS, FLV, WMV, 4K, 8K, etc. to any video format (180+ video and 14+ audio formats) while keeping up to 98% quality reserved thanks to its inherent High Quality Engine. 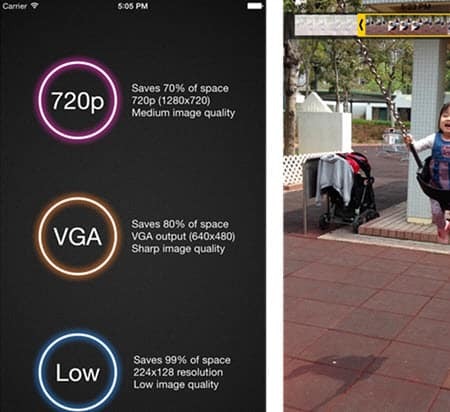 Plus, it also allows you to adjust parameter settings, including frame rate, Bit Rate, video resolution (640*480 recommended for smartphones), codec, etc. More notably, it can also function seamlessly as a solid video editing software to let you cut off the unwanted area of the video and split video to get the video segments you desire to reduce file size. All these tasks can be accomplished at one stroke with only mins or even secs (world's fastest speed), thankfully, its hyper-threading tech, multi-core (up to 8) CPU and unique level-3 hardware acceleration tech powered by Intel QSV, Nvidia CUDA/NVENC, and AMD app. Have this software downloaded on your computer? 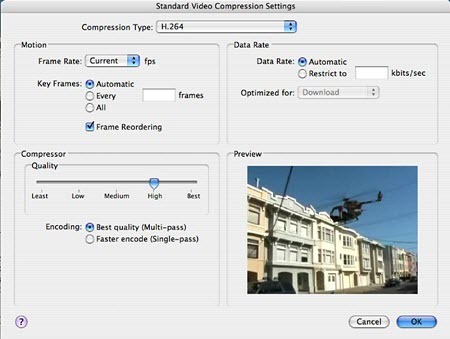 You are lucky to get it as the video file compressor won't let you do other parameter settings at all. With 350+ ready-made profiles built in, you can effortlessly compress videos to any format, with all codecs, resolutions, bit rate, frame rate adjusted, yet retaining the best output quality, small video file size, but fast compression speed. Step 1: Free download the tool, launch it and click "Add File" to load the video files you want to compress. If you are running on OS X, feel free to download the Mac version. Step 2: Select the output format you desire. By the way, if you want to upload the compressed video file to online websites, e.g. compress video for YouTube, FaceBook and more, MP4 or FLV is highly recommended to you. Note: In this step, you are allowed to adjust the video parameters including Resolution, Bite Rate, Frame rate etc or cut the unwanted black bars to reduce the size of your video file. But you should keep balance between the video size and the video quality. Step 4: Hit the "RUN" button on the main interface of this HD video compressor to start compressing video files. 1. Keyframes: The decisive matters on lowering file size are keyframe which has a large impact on the size of your finished file. Higher keyframes will make higher quality but larger file. Please keep the keyframe the same as the frame rate. 2. Bit rate: A variable bit rate will result in smaller file size, too. For SD video, use a bit rate between 2k-5k kbps. 720p video should have a bit rate between 5k-10k kbps while 1080p have a bit rate of 10k-20k kbps. 3. Frame Rate: Please make sure the frame rate be the same as the original. Or else, the final files will not playback normally and even the audio will not be synced with video properly. 4. Format: Format is another matter influencing on the file size. Mostly, MP4 owns the merits of efficient compression and wide compatibility. Devices like iPhone iPad PS4 can play videos in this format while online web sites like YouTube, Facebook or so accepts the format as well. 5. Codec: While you compress video files, choosing a right codec will be important. Mostly, H.264 is the preferred codec for uploading videos for streaming further. 6. Resolution: Resolution is the size of the outputted video. Higher resolution usually leads to bigger file size of the video. Generally, a 640*480 resolution is recommended if you are not much care of the quality. 7. Audio: Choose AAC-LC as the audio format in consideration of the widest support and high quality. Select the data rate at 320 kbps and the sample rate at 48.000kHz. 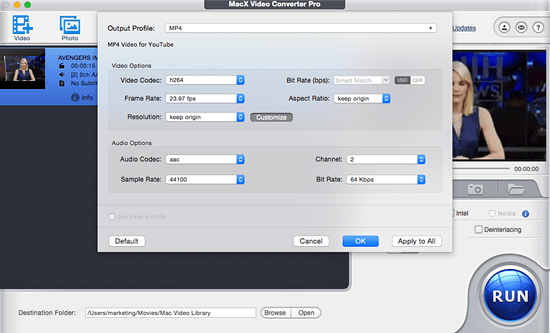 Follow the guide to compress 4K/HD video on Mac, reduce video size for email, resize video for YouTube. PS: This top video size converter also enables you to directly convert and compress video files to mobile devices like iPhone 7/6S/Plus/6/6 Plus/5S/C, iPad mini 4 Retina/Air 2, Galaxy S7 Edge/Note 5, HTC One M10, Sony, Microsoft, etc. 350+ device profiles designed. And downloading online video audio from over 300 video audio sharing sites, YouTube, Facebook, Vimeo, Vevo, Instagram, Dailymotion is just another plus to its talents. Step 5. Save & share converted videos. Let's cut to the chase. The iOS app worth a mention is the easy-to-use Video Compressor (iPhone), which can be downloaded and purchased in iTunes to run well on your iOS 8 or later iOS powered iPhone iPad like iPhone 6s/6s Plus, iPad mini 4/Air 2, iPod, etc. This application can compress video recorded by Camera App and reduce over 70% of file size when you change video resolution from 1080P to 720P. And more importantly, it enables you to make video compressed on your iPhone and directly shared videos to website via third-party help or E-mail. Excellent! Compressed a 310Mb mp4 video to 8Mb in 14 minutes. Really very good vid compressor Video quality is a bit down, a bit (which is expected) BUT this app size itself needs to be compressed. 9 mb? I mean, seriously! Even instagram is 10 mb. QuickTime 7 Pro, as the member of Apple big family, is suitable for you to compress MOV, MP4 video files. Here we take compressing MP4 for instance. Step 3. Choose Export. In the Export menu, opt for MP4 video file to QuickTime video. Click the Options button and then the Video Settings button to set your compression preferences. To ensure a smooth playback, keep Frame rate the same as original; set key frames and data rate Automatic; and set the compression type to H.264 to ensure the widest compatibility with mobile devices. Step 4. Tune up your compressor quality and parameter settings. Mostly, lower the quality will downsize the file but result in more artifacts in the final compression. For the highest quality compression, choose Best Quality (Multi-pass) or opt for Faster Encode (Single-pass) to get smaller size and ensure fast encoding process. 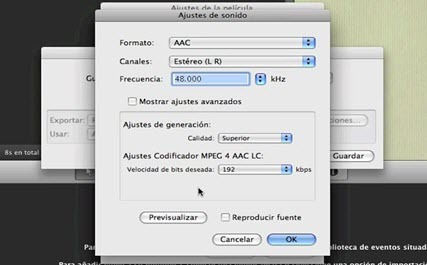 set audio rate to 48.000 to keep file size down; To upload videos to YouTube or Vimeo, you can set Quality to Normal, set target bit rate to 40 kbps. Step 5. Remove the unwanted part of the video and gets the desired video segments. When it comes to video editor, the first one appearing on my mind is the Apple iMovie, which can compress video and downsize the file half of the orignal one. Step 4: Go to File > Share > File; Lower resolution and Qaulity to make a smaller file size; Click Next and name the file; then click Save to end the video files compression task. In short, the above 5 solutions are effective for you to compress video files on computer and iPhone Android. You can pick out the most suitable one to have a try. As a friendly reminder, I wanna say, after video file size shrinking, you're capable of using a free media streamer-5KPlayer to free stream video from iPhone iPad to Mac or Windows PC. What's more, if you have any demands on downloading YouTube videos, making photo slideshows, recording online videos and editing videos, MacX Video Converter Pro is your best choice. This article illustrates you how to compress and convert 4K to 1080P video for easier playback and editing on more players and devices under the aid of a solid 4K video converter. 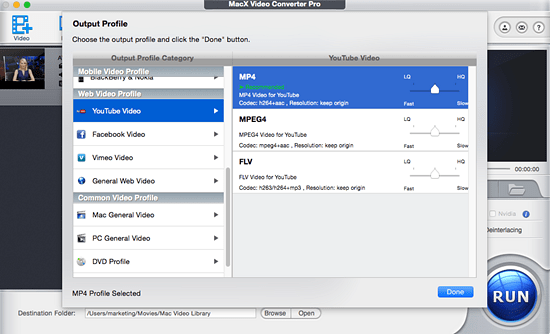 MacX Video Converter Pro offers you the simple yet all-round way to compress and reduce MP4 file size to AVI, FLV, WMV and more smaller-sized formats. 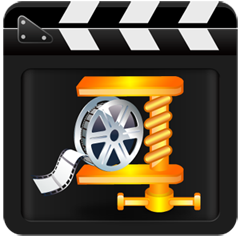 Also losslessly compress MP4 file size with parameter adjustment and video editing features. Compress large Video Files to Smaller Size. No Quality Loss!